I am looking for a boot knife that will strap either to the outside of a duty boot, or be comfortable enough with sheath to be inside a duty boot. I am looking for a good quality knife, not something cheap. Anyone have any suggestions based on experience? I have a couple of boot knives-never carried them in a boot. S&W HRT rides upside down in my Andrews leather triple mag carrier shoulder holster & my other “letter opener” is always slipped in my truck’s driver side front windshield column. The HRT is inexpensive but not cheap-I would call it a good value in a boot knife that’s perfect for self defense. When I was aircrew on helicopters myself and quite a few others carried the Gerber Guardian or the next sized bigger Gerber (can't remember which model) they are great boot knives! They were made in USA at that time and sold at the PX at Ft. Bragg. Can't remember what happened to mine, it held up well to corrosion in a salt/jungle environment of Latin America however the clip on the sheath got pretty rusty. TSKnight, G26Raven, Instymp and 1 others like this. Usually either my 1980's vintage Western boot knife or the Gerber Guardian by R. W. Loveless, of the same vintage, although I do have a couple of folders that have filled the role a time or two. ok, maybe I am too critical, but I equate boot knives with ankle holsters. They are not easy to get to when you are on your feet. What Am I missing? Seriously, tell me. I too carried the Gerber Guardian while flying C-5s, nice strong lightweight knife. TSKnight, G26Raven, Instymp and 4 others like this. A friend's older brother, who was a navigator on a B52 out of Ellsworth, gave me my Guardian as a graduation present. Will soon be 37 years. Guess it has served me well. G26Raven, msgt/ret, Pete63 and 5 others like this. I have carried the older version of the safe maker by cold steel in a boot for over a decade. It stays put and secure. It's the only knife I carry that I hope to never use, so why not that type? If I need it, I will really need it. G26Raven, Instymp, msgt/ret and 3 others like this. Okay, 5Lima30ret, TSKnight, msgt/ret, and viney266, how do you wear these knives? Strapped to the outside of your boot, inside the boot, or???? A boot knife is a last option when all else had failed, you've been stripped of other tools to defend yourself with and there's nothing left. Just a last layer of potential defense. Snub44, G26Raven, Pete63 and 6 others like this. I carried mine with the clip inside the lace up flight boot and the knife on the outside. I did have to flatten the bottom of the clip slightly to prevent it from digging into my leg. G26Raven, Pete63, airslot and 1 others like this. In the early 70s, I carried the Gerber Guardian I on the inside of my calf, slotting the cowboy boot and clipping the sheath in low enough that about 2" of handle showed above the boot top. Comfortable and easily accessed. AzQkr, G26Raven, Pete63 and 2 others like this. I have written about this knife before. This is my standard carry but offen I have carried it a boot knife, carried on the inside of the calf. One knife you might want to take a look at is the Cold Steel Koban. It is a flat 5 ½ inch blade very light boot knife that you can get for under $40. The blade is super sharp keeps an edge. I have always carried it on my duty belt. 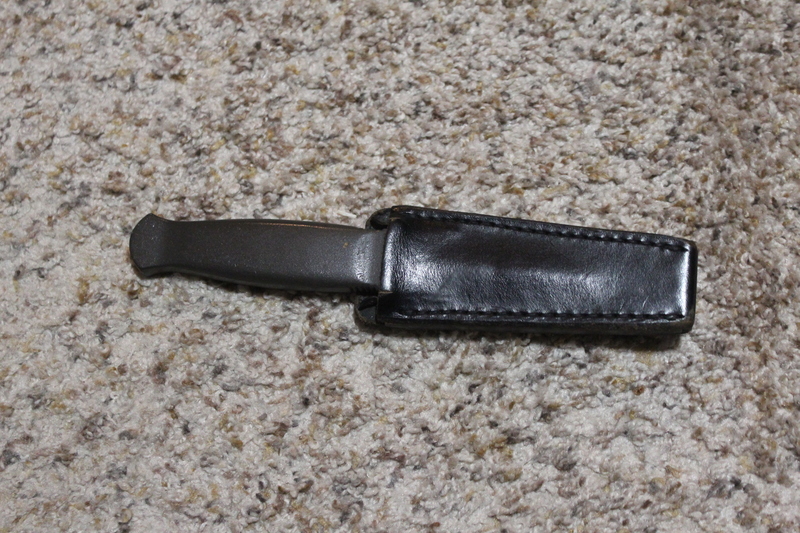 I carry it with the sheath tucked into my pants in a reverse carry and clipped to the inter-belt liner on my off-side. It tucks in between my collapsible baton and my radio. This is my get off-of-me knife. No one ever notices it. This setup is hard to beat. msgt/ret, TSKnight, G26Raven and 2 others like this. I have a leather strap added inside the shaft of my right boot. It is low enough that I can lift my pant leg and the handle is not visible except from directly above. Very little movement and secure even if moving quickly. Most of the time I carry the Western that way. The Guardian works better carried sideways at the belt line. In fact I sometimes position it behind my belt buckle. It tends to flop around in the boot. After a long day, the inside of my leg gets sore. The Western doesn't flop, so it is more comfortable. I have a Boker lever knife that works well as a boot knife. 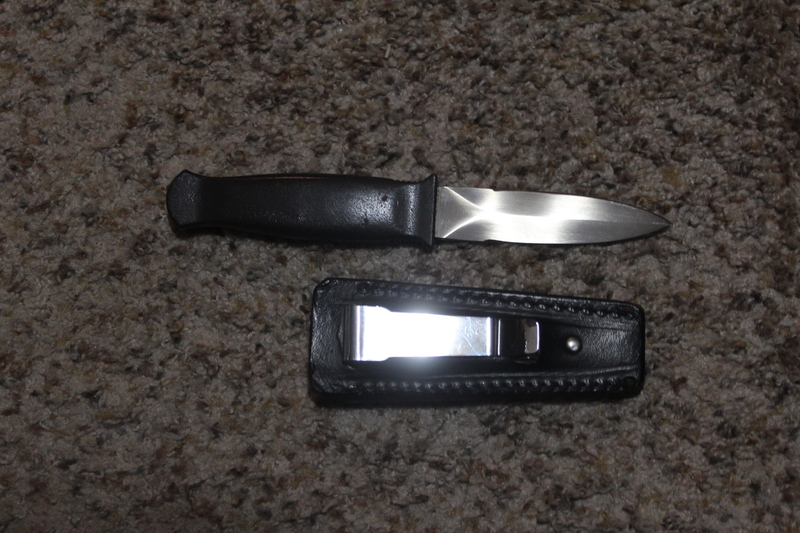 It fits perfectly behind the strap and appears more utilitarian than the Western with it's double edged dagger profile. msgt/ret and G26Raven like this.